Two small towns in the heart of Najd, namely Uyaynah and Huraimala, embraced Imam Muhammad Bin Abdul Wahab before he set out to Al-Dar’iyah, which would later become the cradle of his “reformist call” that would resonate over many parts of the Muslim world for centuries. Although Al-Dar’iyah, its mosques, alleys and walls tell the story of the reformist call that started from this small town to resonate in the far reaches of the country and beyond, nothing in the city of Huraimala indicates that Sheikh Bin Abdul Wahab started his call or lived an important part of his life there. 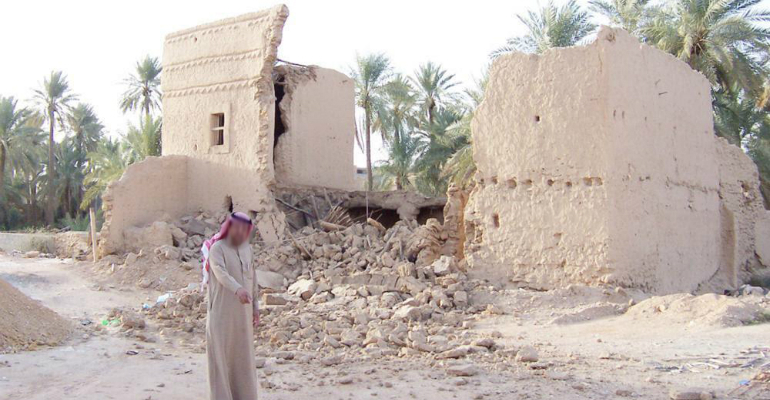 Few people in Huraimala, just 85 kilometers northwest of the Saudi capital Riyadh, seem to be familiar with the location of the mud house where the Sheikh lived a few years before he moved to Al-Dar’iyah along with a small number of the elderly people of the town. Everyone I asked about the site said it was far away and that it no longer exists. Despite the disappointing replies, I was determined to go and find the location of the house of Muhammad Bin Abdul Wahab. In fact, the task was not an easy one. Everyone I asked about the house during my tour of the city’s neighborhoods said they did not know. I met others who knew the neighborhood where the house was located but were unable to locate it accurately. The authorities feared that it would develop into a phenomenon that is not related to the Islamic tradition and would negate the reformist call originally aimed at fighting and warning against these kind of attitudes. Guided by the father of this young man, we arrived at the demolished house, a three-hundred-square-feet area surrounded by old mud houses. According to identical testimonies, the house of Sheikh Muhammad Bin Abdul Wahab was located in the center of Huraimala near the city’s market. The total area of the palace is about 275 square meters. It overlooked the main street with a width of 12 meters. I wanted to learn more than what the old man told me, and so I searched the archives for any documents indicating the reason for the removal of the house. I found a statement by the former mufti of the Kingdom, the late Sheikh Abdul Aziz Bin Baz, under the title, “Restoration of the house of Sheikh Muhammad Bin Abdul Wahab in Huraimala.” It was dated 21/10/1412 AH. Sheikh Bin Baz said in his statement, “Praise be to God and prayers and peace be upon the Messenger of Allah, his family, his companions and those guided by his hands. After the Riyadh newspaper published in its issue of 21/10/1412 AH an article under the title “Restoration of the house of Sheikh Muhammad Bin Abdul Wahab in Huraimala”, he mentioned that the General Directorate of Antiquities and Museums paid great attention to the house of the Salafist sheikh in the neighborhood of Ghilan Huraimala, where it was maintained and restored with clay material similar to the original building material.